Married Name 12 February 1912 As of 12 February 1912,her married name was Premo. Dora Elizabeth Hill was born on 6 November 1886 at Sumpter, Sauk, Wisconsin. She married Kenneth Lyle Premo, son of Charles Stephen Premo and Grace Kellogg, on 12 February 1912. Dora Elizabeth Hill died on 3 April 1984 at Sauk, Wisconsin, at age 97. Name Variation Mahala Josephine Mercer was also known as Malaha. Married Name 25 December 1850 As of 25 December 1850,her married name was Chapman. Mahala Josephine Mercer was born on 21 May 1834 at Jackson, Ohio. She was the daughter of Levi Martin Mercer and Belinda Cantwell. Mahala Josephine Mercer married Robert Ross Chapman on 25 December 1850 at Jackson, Ohio. Mahala Josephine Mercer died on 30 May 1884 at Scioto, Ohio, at age 50. [S246] U.S. Federal Census 1880 U.S. Federal Census, by Ancestry.com, NA Film Number T9-1064 Page Number 103B. Robert Ross Chapman was born on 10 March 1823 at Jackson, Ohio. He married Mahala Josephine Mercer, daughter of Levi Martin Mercer and Belinda Cantwell, on 25 December 1850 at Jackson, Ohio. Robert Ross Chapman died on 9 May 1902 at Scioto, Ohio, at age 79. Name Variation Francis Marion Chapman Sr. was also known as Frank. Francis Marion Chapman Sr. was born circa 1874 at Ohio. He was the son of Robert Ross Chapman and Mahala Josephine Mercer. Name Variation Dorothea M. Hickcox was also known as Hickox. Name Variation Dorothea M. Hickcox was also known as Dorothy. Married Name 6 September 1924 As of 6 September 1924,her married name was Cass. Dorothea M. Hickcox was born in 1906 at Wisconsin. She was the daughter of Guy L. Hickcox and Myra P. (?). Dorothea M. Hickcox married Vern T. Cass, son of Francis J. Cass and Eleanore Amelia Kremer, on 6 September 1924. Dorothea M. Hickcox died in April 1932. [S244] U.S. Federal Census 1910 U.S. Federal Census, by Ancestry.com, Year: 1910; Census Place: Bear Creek, Sauk, Wisconsin; Roll T624_1736; Page: 8B; Enumeration District: 110; Image: 782. [S243] U.S. Federal Census 1920 U.S. Federal Census, by Ancestry.com, Year: 1920;Census Place: Bear Creek, Sauk, Wisconsin; Roll T625_2015; Page: 4B; Enumeration District: 160; Image: 10. [S250] U.S. Federal Census 1930 U.S. Federal Census, by Ancestry.com, Year: 1930; Census Place: Richwood, Richland, Wisconsin; Roll 2608; Page: 2A; Enumeration District: 18; Image: 845.0. Abraham Wallace married Hepzibah Blake. Married Name Her married name was Wallace. Hepzibah Blake married Abraham Wallace. Name Variation Jeremiah Gordon Marden was also known as J. G.
Jeremiah Gordon Marden was born on 2 November 1815 at New Hampshire. He married Nancy W. (?) on 26 March 1838. 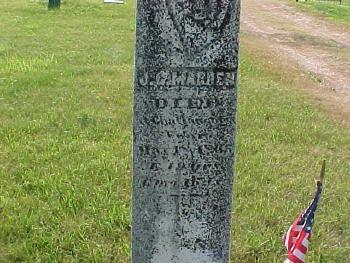 Jeremiah Gordon Marden died on 18 May 1865 at Tennessee at age 49. 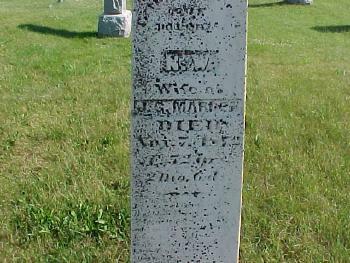 He was buried after 18 May 1865 at Willow Valley Cemetery, Ithaca, Richland, Wisconsin. Name Variation Nancy W. (?) was also known as N. W. (?). Married Name 26 March 1838 As of 26 March 1838,her married name was Marden. Nancy W. (?) was born on 1 September 1820 at New Hampshire. She married Jeremiah Gordon Marden on 26 March 1838. Nancy W. (?) died on 7 November 1872 at age 52. 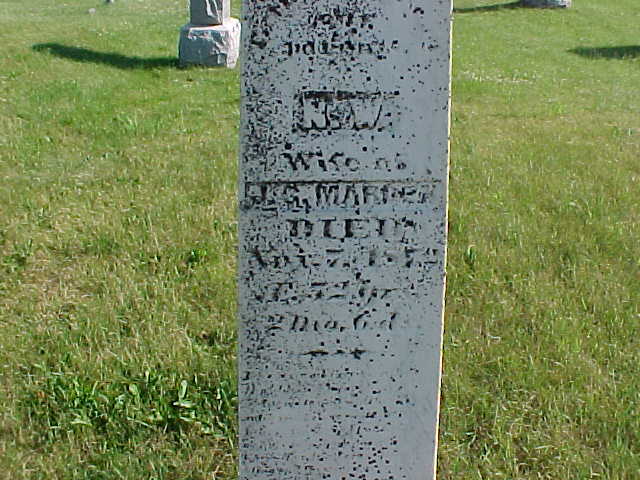 She was buried after 7 November 1872 at Willow Valley Cemetery, Ithaca, Richland, Wisconsin. William Weller married Ellen (?). Married Name Her married name was Weller. Ellen (?) married William Weller. Name Variation Anna Schoening was also known as Annie. Married Name 16 November 1874 As of 16 November 1874,her married name was Ortscheid. Anna Schoening was born on 6 June 1853 at Germany. She was the daughter of (?) Schoening. Anna Schoening married Andrew Ortscheid, son of Joseph Ortscheid and Mary Ann Blint, on 16 November 1874. [S246] U.S. Federal Census 1880 U.S. Federal Census, by Ancestry.com, NA Film Number T9-0327 Page Number 217D. Jessie Ortscheid was born on 9 May 1878 at Iowa. She was the daughter of Andrew Ortscheid and Anna Schoening. Married Name Her married name was Robinson. Laura Ortscheid was born on 27 July 1880. Married Name before 1862 As of before 1862,her married name was Ortscheid. Unknown (?) was born at Belgium. She married Andrew Ortscheid, son of Joseph Ortscheid and Mary Ann Blint, before 1862 at first marriage for him. Married Name 15 June 1880 As of 15 June 1880,her married name was Wiley. Mary Ortscheid was born on 29 August 1862 at Wisconsin. She was the daughter of Andrew Ortscheid and unknown (?). Mary Ortscheid married (?) Wiley on 15 June 1880. (?) Wiley married Mary Ortscheid, daughter of Andrew Ortscheid and unknown (? ), on 15 June 1880. Sybille Ortscheid was born on 4 May 1866. Sybille Ortscheid died on 9 September 1866. Married Name Her married name was Ellsaser. Married Name Her married name was Ellsasar. Adelia Ortscheid was born on 29 October 1867. Peter Ortscheid was born on 11 October 1871. He was the son of Andrew Ortscheid and unknown (?). Peter Ortscheid died on 17 January 1876 at age 4. Married Name Her married name was Howland. Maggie Ortscheid married Edward Howland. Maggie Ortscheid was born on 19 September 1873 at Iowa. Edward Howland married Maggie Ortscheid, daughter of Andrew Ortscheid and unknown (?). John Ortscheid was born on 7 September 1863 at Cassville, Wisconsin. John Ortscheid married Mary Bardwell on 26 January 1887. Married Name 26 January 1887 As of 26 January 1887,her married name was Ortscheid. Mary Bardwell was born on 24 April 1868 at Massachussets. She married John Ortscheid, son of Andrew Ortscheid and unknown (? ), on 26 January 1887. Emory Ortscheid was born on 24 December 1888. He was the son of John Ortscheid and Mary Bardwell. Beatrice Howland was born on 27 June 1894. She was the daughter of Edward Howland and Maggie Ortscheid. Harold Howland was born on 30 July 1895. He was the son of Edward Howland and Maggie Ortscheid. Orin Wiley was born on 23 October 1882. He was the son of (?) Wiley and Mary Ortscheid. Tillie Ortscheid was born circa 1870 at Iowa.